With the help of our makeup artist friends, we designed this unique shade by combining equal parts Cool and Warm elements to make these stunning shades appropriate for all skin tones: We started with Pink and Peach (two colors that naturally brighten the face) then added Silver and Gold, for a gorgeous, subtle shimmer. For a little “oomph!” the tone is slightly darker than the natural color of the lips and the natural flush of the cheeks.And voila – Simply Beautiful! Available in a Semi-Matte lipstick, Sheer Lipstick, Lip Gloss and Crème to Powder Blush. We consulted with top makeup artist and used color science to design two products and one perfect shade for any occasion! 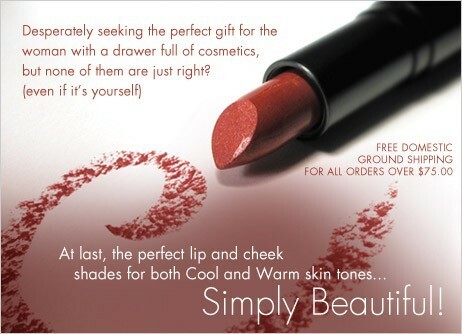 Try Simply Beautiful Lip Gloss and Simply Beautiful Cheek Tint for a healthy, youthful glow!